Forget about the future for a moment. Let’s clean up the mess now. Start cleaning now . . . with the ORCA! Watch the extended version video here. What makes the ORCA unique? 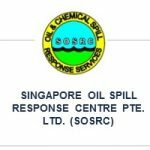 A multi-purpose award winning Environmental Cleanup and Recovery System. 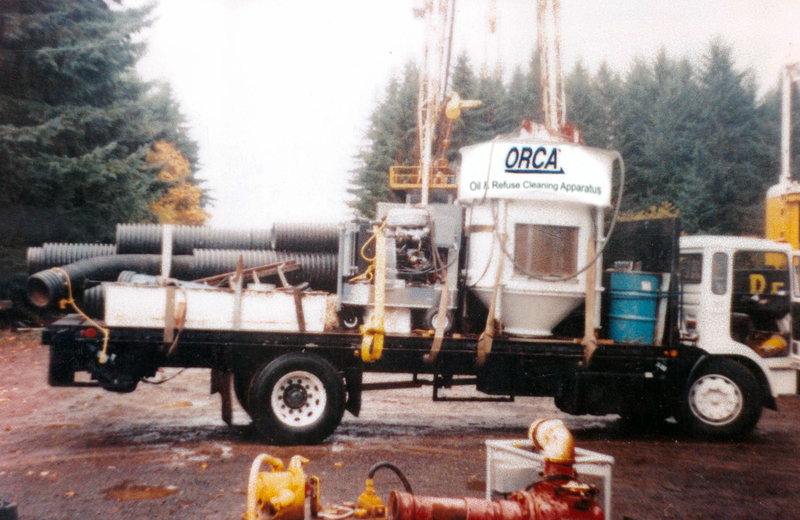 Two years of R&D employing Ex-Boeing Wind Engineers and Marine Engineers, lead to the creation of the ORCA! 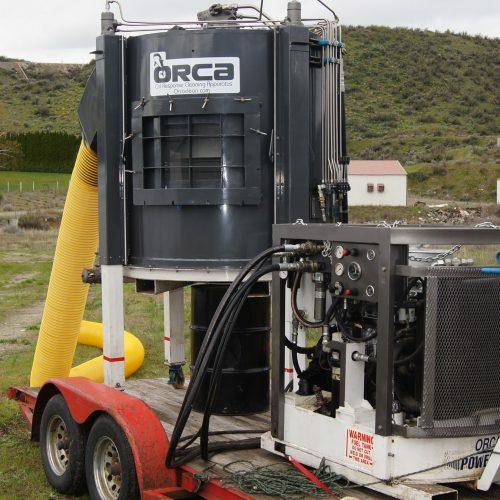 The ORCA has been built, sold, used and proven in the field as well as certified by ABS (American Bureau of Shipping) & Lloyds Register Type Approval. Using powerful vortex technology, the ORCA generates wind speeds of up to 180 kph like a tornado, giving it the lifting power to pull debris up its suction hose. 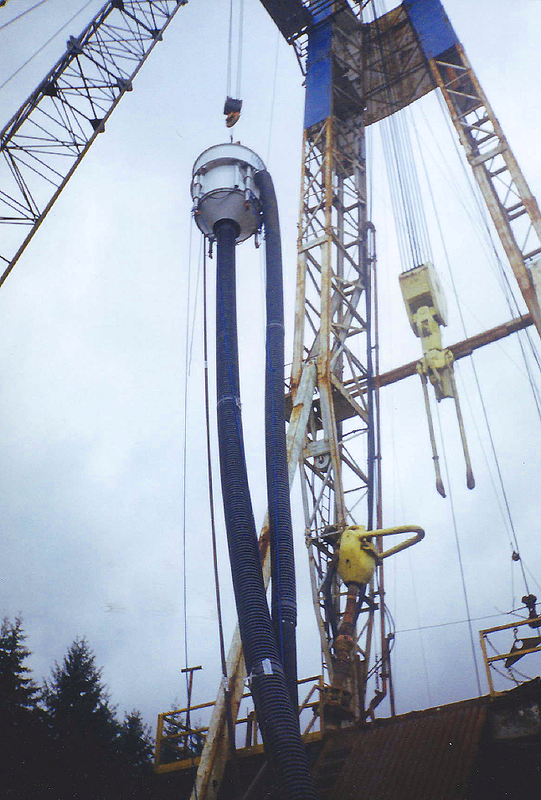 Using the Universal Hatch Cover the hose drops plastic, algae, debris or oil directly into a receiving tank or container, without passing through any machinery, allowing large quantities to be recovered. 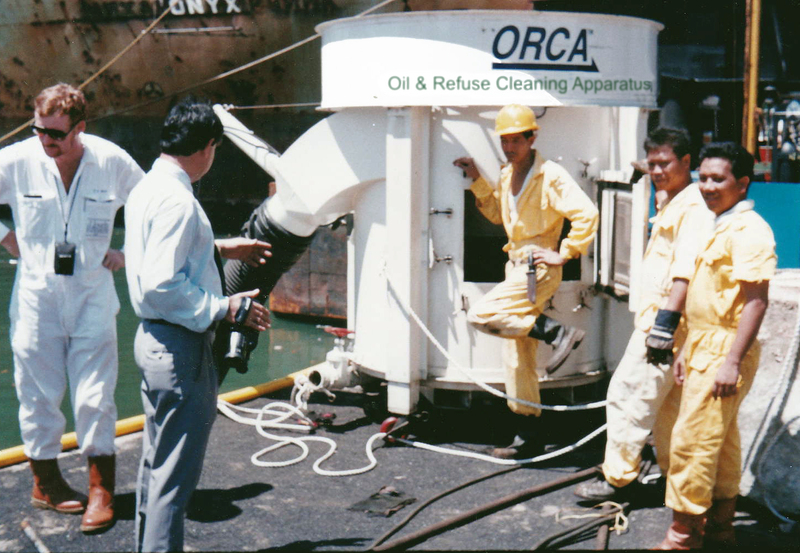 Because the recovered material does not pass through any machinery, means the ORCA is virtually impossible to clog AND, at the same time, any wild marine life taken into the hose mouth, remains unharmed and can be safely removed from the receiving tank. Existing skimmers are not able to cope with these elements as the recovered material passes through machinery. 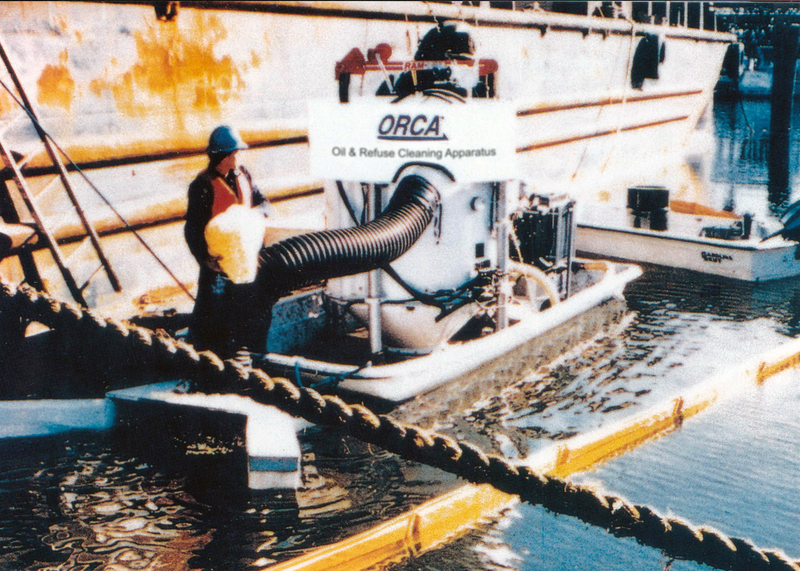 With the ORCA there is no machinery between the intake hose and receiving containment unit. The ORCA can cope with all these elements using its powerful Vortex technology. 1. It works on land as well as in a marine environment. 2. It is able to recover large volumes using its Universal Hatch Cover™. 3. It has multiple environmental applications making it a viable economic technology to own. What is the main focus of the ORCA technology? 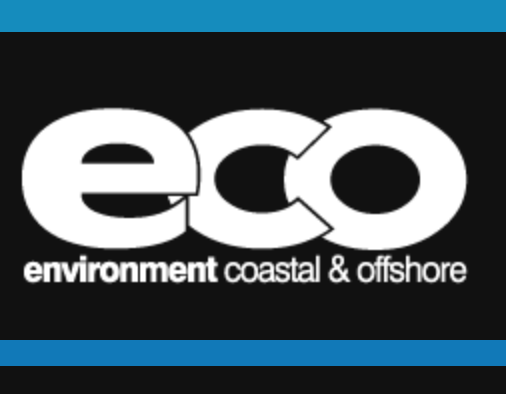 Deadly floating plastic, invasive algae, spilled oil. 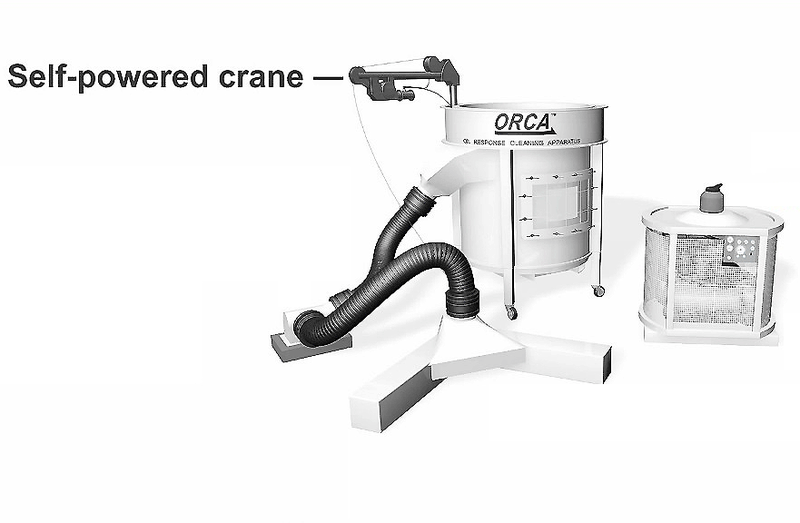 Turning on the ORCA’s power pack creates a high-velocity air flow like a tornado generating a wind speed up to 180kph (120mph) which can target materials to lift weighing over 28kilos (61 lbs) vertically 30m (100ft) in 4 second certified by ABS (American Bureau of Shipping). The Orca is virtually clog-proof. 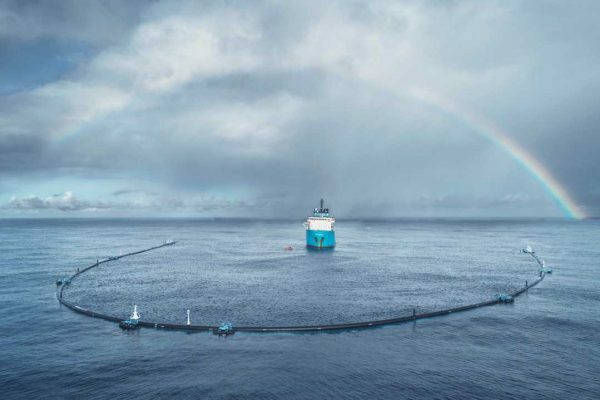 It pulls deadly plastic, invasive algae, oil, tar balls and debris straight up its hose and directly into a receiving tank, without passing through any machinery. 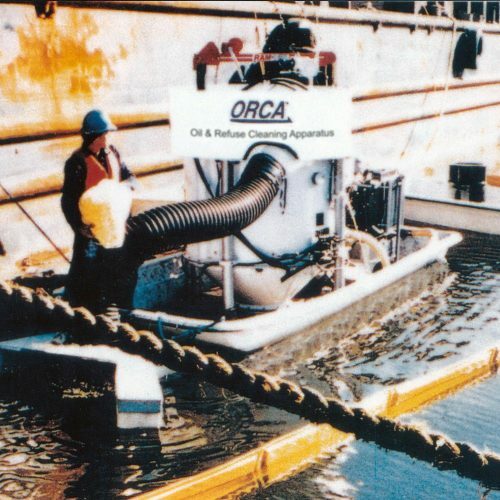 When used for oil recovery, it looks as if the ORCA is actually peeling the oil from the water. Since oil is lighter than water, its weight and cohesive factor make it possible to separate the oil in this way. 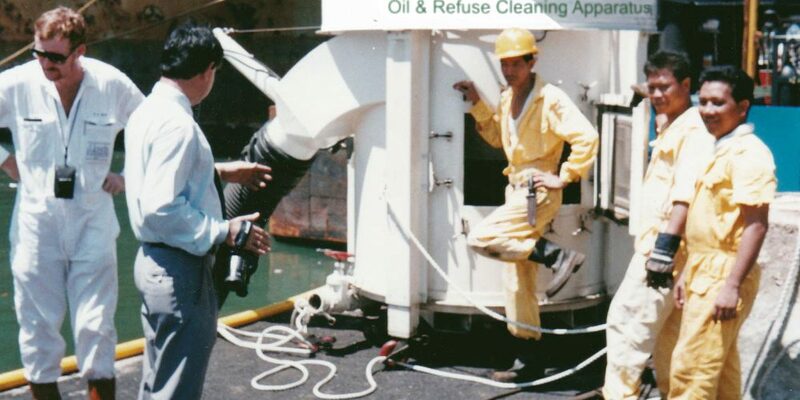 Using the Universal Hatch Cover the hose drops plastic, algae, debris or oil it directly into a receiving tank or container without passing through any machinery and also allows very large quantities to be recovered. 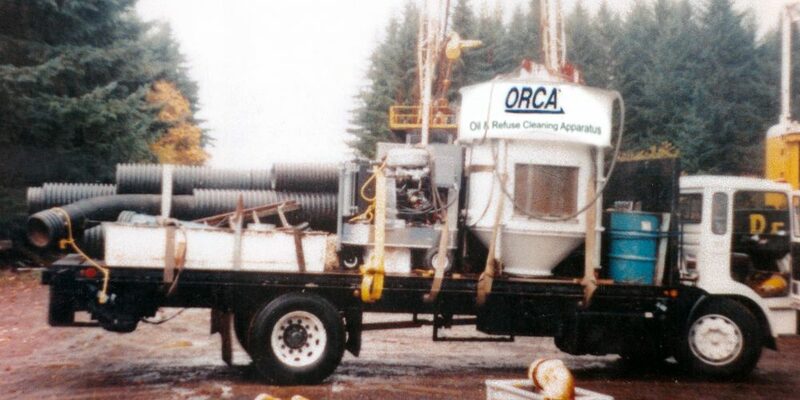 Because the debris does not pass through any machinery, this means that the ORCA is virtually impossible to clog, so there is no need for frequent maintenance stops or downtime. The Universal Hatch Cover fits most deck openings (can be modified on site), and is an essential part of the ORCA, since it makes it possible to move materials directly into the hold of a vessel or any standard container. The ORCA comes as a self-contained unit with a power pack, flotation device, Universal Hatch Cover and flexi durable hoses. 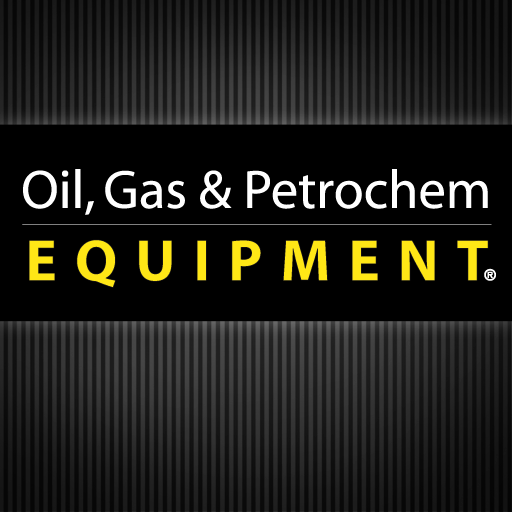 It can be used on board a tanker, barge or even on top of a small light weigh truck or tracked vehicle to accommodate a wide range of application needs. For shipping information, see under tab Specifications. 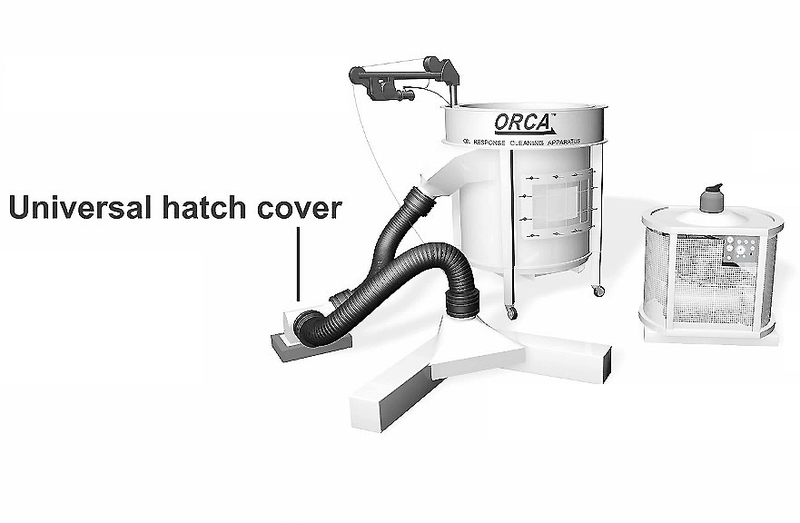 A two person team can easily operate the ORCA. 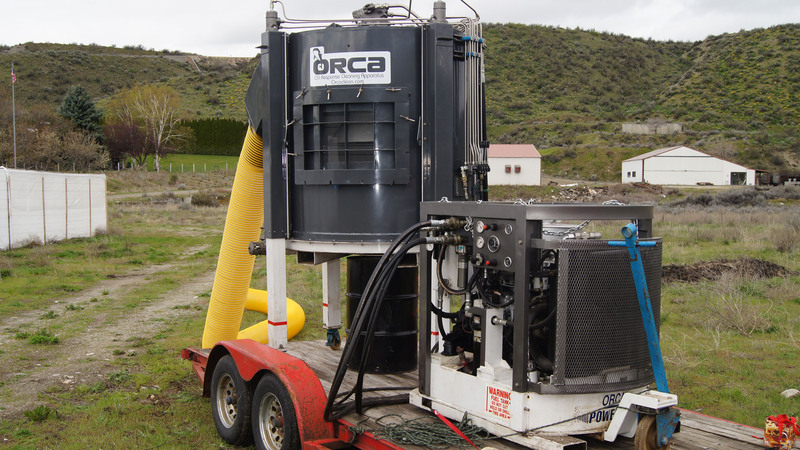 The ORCA comes as a self-contained unit with a power pack that can use a hydraulic start or optional fuel such as diesel, LPG or an electric system. The self powered crane makes it easy to put the hose in position. 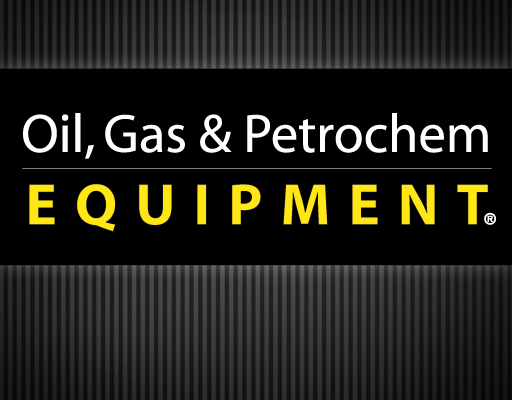 Most oil recovery equipment is single-purpose, and sits idle when not being used for oil spills. 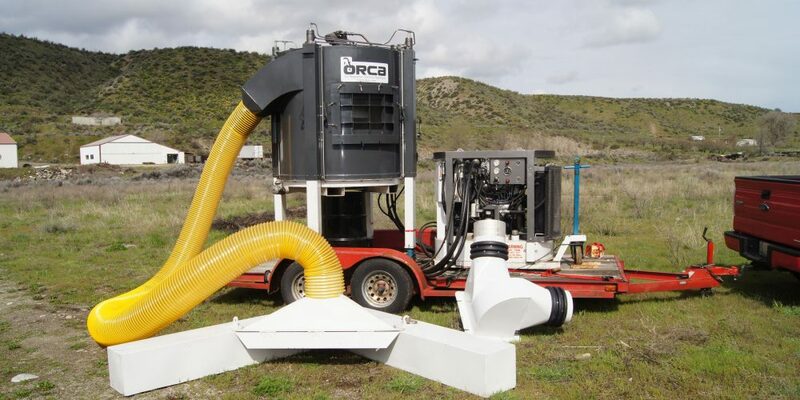 Since the ORCA can be used in a variety of clean-up operation such as plastic pollution, algae and marine debris, it can be profitably used all year round – especially since its lighter weight, flexible in operating in various locations including embankments making it economical to use. 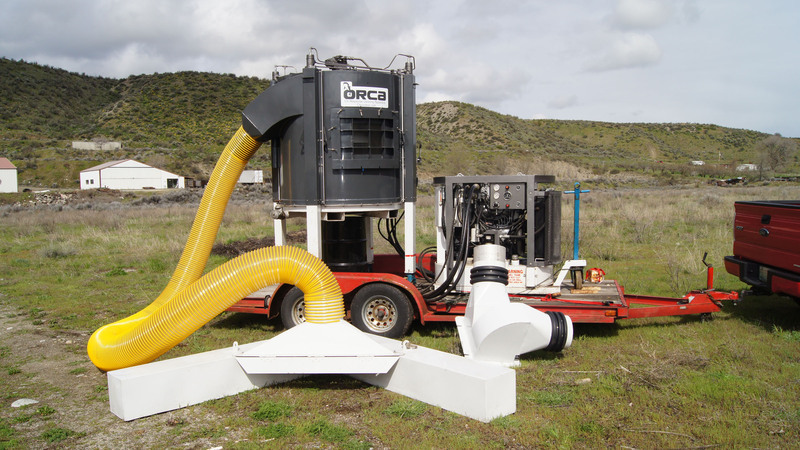 The ORCA can also be used to clean tanks, farm slurry, industrial waste, ports and beaches – and do it faster than existing manual methods, cranes, grabs and tractors. For plastics and algae, the competition is made up from manual labour, cranes, grabs, tractors, conveyor belts all these are slow recovery methods compared to the speed and flexibility of the ORCA which works on land and water. On beaches embankments, rivers, lakes, oceans. The award-winning ORCA is endorsed by users (see testimonials) and has been certified by ABS and Lloyd’s Register Type Approval. The 116 HP diesel-driven hydraulic power. Diesel to comply with IMO 2020 standards of 0.5% sulphur. Options exist for LPG or Electric driven as a power source. Weight 500 kg. Universal Hatch Cover™: An Aluminium steel adapter to couple the ORCA to a vessel’s tank, hold or to an ordinary container. Collection Device for the beach or land: Bespoke design depending on the terrain the ORCA will be used on. The technology is owned by a private entrepreneur who conceived it in the wake of the Exxon Valdez oil spill disaster (1989). To date 100% equity funded. The project was shelved in 2001 due to competing personal priorities of the shareholder who now wishes to revitalize & launch it commercially on a global scale. 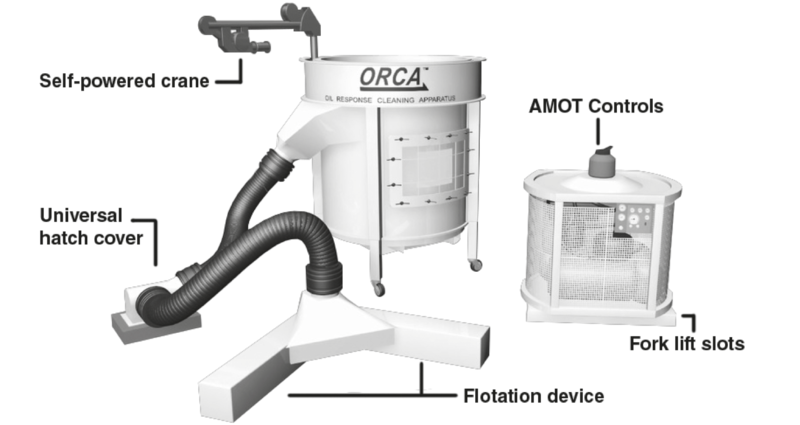 The initial & basic business model is to manufacture & market ORCA units for sale to end users globally. When critical mass is reached, an operating leasing model (i.e. 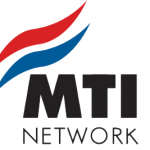 “provider of cleanup services”) may be evaluated on merit & on a case-by-case basis.